This correspondence course is ideal for those who have already attempted the technique of application without having managed to know the best approach or for those who want to upgrade their qualification. It imparts valuable knowledge by self-study with the aid of which you can feel confident upon adequate practice. For 60% of the participants it is an optimal way of training without having to adjust to training schedules or having to travel to the training centers. want to acquire a certificate as a proof of their qualification. You yourself can set the tempo of learning in the comfort of your place of work and moreover at times that are best suited to your convenience. As soon as you are adequately prepared we will send you a written and practical test / assignment. Thereafter send us your test papers. Upon passing the test we will issue a certificate declaring you to be an „XXL Lashes Stylist“. This course is available in the following languages: English, German, Spanish, Italian, French. Please specify your language preference in the „Observation field“ of your order form. 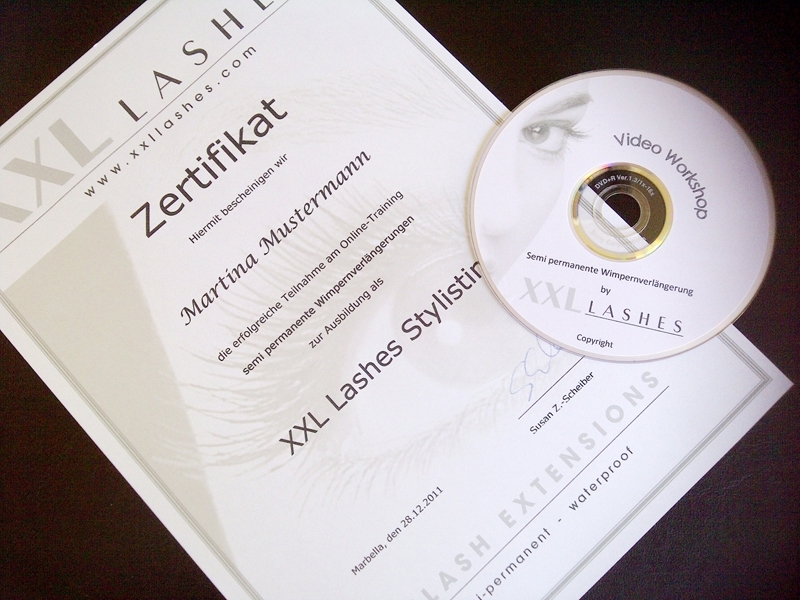 a certificate declaring you to be an XXL Lashes Stylist upon successfully passing the test. Would you rather go for a one-day training session by an experienced trainer? Then the XXL Lashes Workshop is just right for you.